When it comes to backyard privacy and security, choosing a vinyl or wooden fence are both sound and reasonably-priced options. Let’s explore the pros and cons of each type to decide which is right for your home. Which Is a Better Material? Vinyl fencing is an attractive and low-maintenance addition to any home. Available in a variety of styles, its non-porous surface makes cleaning easy. With regular maintenance, it can last decades. People often use the terms “vinyl” and “PVC” interchangeably, but the materials are not the same. PVC is a type of vinyl known for its durability and affordability. Manufacturers only use PVC for this type of fencing. These come in a wide variety of types and styles at a broad range of price points, making it an appealing choice for homeowners. Known for being aesthetically pleasing, lumber typically requires weatherproofing to improve longevity. Need to find a fencing pro? Which Is a Better Fencing Material? When comparing all types of wood to vinyl, which material is best? Vinyl and PVC fencing costs about $17 per linear foot, excluding installation. Wood fencing costs about $12 per linear foot. Both are available in a variety of styles, but which is more aesthetically pleasing? Looks newer longer. You can buy panels, decorative toppers, and rails off the shelf in a variety of colors and styles. The overall look is less appealing. Its synthetic appearance stands out against natural background. Natural look appeals to most homeowners and blends in well with surrounding foliage. Style options, like picket and split rail, can match any budget. Its look can degrade over time, causing a negative impact on curb appeal. Which material works better for privacy fencing? Won’t expand or contract, leaving no gaps and ensuring privacy. They come finished on both sides, so your neighbor won’t have to look at an unattractive “back” side. 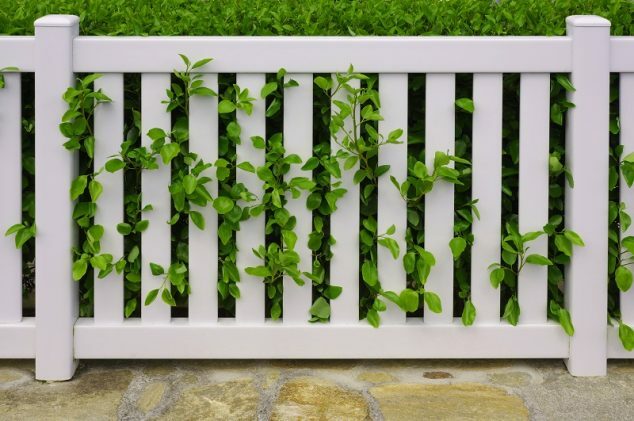 Vinyl lattice fences, which allow more light to pass into your yard, are easier to clean and maintain than wood. Lack of space between panels makes them more susceptible to wind damage. Blends into the environment better than vinyl, creating a more pleasant look while keeping people and pets where they belong. Boards can warp, leaving spaces in between. The back is not as attractive as the front, which may change your neighbor’s view. Which type is easier to install yourself, and which is less expensive for a professional to work with? A fencing pro will charge the same hourly rate for either installation, but a vinyl fence should take less time to install, making it less expensive. Tongue and groove panels and pickets connect easily with one another, making it easier to install for an inexperienced homeowner and less expensive for a professional. Requires a variety of skills and equipment. If it’s longevity you’re looking for, there’s a clear winner. Vinyl – It’s difficult to damage and can last up to 100 years with minimal maintenance. Wood – With regular maintenance, it usually lasts about 20 years. Higher-quality lumber may last longer. Typically fares well against inclement weather, extreme temperatures, pests, and fungus. Tightly-spaced panels do not allow drafts to pass through, making it more susceptible to high winds. Professionals install with small spaces between pickets to allow wind to pass through, making them less likely to fall during high gusts. Insects and moisture can cause rot. Temperature changes cause wood to expand and contract, decreasing its stability over time. Consult with a fencing installation pro? How easy or difficult are each to maintain? No spaces between panels means there is no place for debris to get stuck. Cleaning requires only soapy water or a pressure washer. Shows dirt more readily than other types and requires frequent cleaning. They get dirty, but it’s more difficult to see. Debris from storms can stick in the small spaces between pickets. Cleaning the porous surface can be difficult. If you want your fence to reflect your sense of style, which type should you pick? Vinyl – Produced by manufacturers in a range of prefabricated styles and colors. Once selected, you will not be able to paint PVC or noticeably change its appearance. Wood – You can paint or stain it in any color. You can also seal it with a clear coat to preserve its natural finish. The cost to repair your fence could be a deciding factor in the material you choose. Repairs, while few, usually require the expertise of a professional, so they may cost more. Because it typically comes in panels, replacing a whole panel for a small amount of damage may also be costlier. You can repair or replace pickets quickly and easily using tools and supplies most homeowners own. Installing a fence may increase your home value with added privacy and an updated look. Because these structures keep their appearance better over time, they may increase the resale value of your home by more. If a prospective buyer doesn’t like the finish of an existing PVC fence, they must replace the whole structure. They have a classic look, and you can update them with paint or stain prior to placing a home on the market. Ill-maintained wood fences can reduce a home’s curb appeal. Depending on your budget and other requirements, other fencing types may better suit your needs. If you aren’t sure which type is best for your home, you may want to consider a composite wood fencing option. At around $25 per foot to install, composite initially costs more but needs virtually no maintenance. They offer the look of wood and the ease of vinyl, making it a happy medium for many homeowners. Aluminum fences cost more up front, but they are inexpensive and easy to install. Metal fencing costs between $2,000 and $5,050 to install and is easier to maintain than wood over time. However, it doesn’t offer the privacy of wood or vinyl. Strength varies depending on the type of metal you choose. Chain link fencing is inexpensive, maintenance-free, and durable. It does not offer much in the way of privacy or appearance, however. Wrought iron fencing costs range from $1,300 to $4,200. In addition to being strong and low maintenance, wrought iron is perfect for decorative designs and high-security applications. The effect of weather on the material increases its beauty over time. It is also the most expensive choice. Big box stores sell wood fencing, or you can buy it at local lumber yards or mills. Each of these retailers features product from the top lumber producers. When looking for a vinyl brand, consider factors like quality and the availability of a warranty. I used to install fence many years ago. I cringe when I see a PVC fence. They are not as durable as a good quality wood. A basketball will usually crack or break a fence panel. The only way to fix it is by replacing the panel. If kids climb the fence it will most likely be damaged. Post caps fall off and get lost. If a car hits a vinyl fence it blows right through it. Not so much with wood. Vinyl fence was put up around a gazebo in my town. Within a week the rails broke off due to people sitting on them or leaning on them. I inspected it and saw that construction screws were all that held it up, vinyl to vinyl. After many attempts at fixing it the town gave up and there are no fence sections on it any longer. One town away there is a gazebo with wooden rails that are a solid as a rock and over 60 years old. Also vinyl siding is in the same category. I see vinyl siding hanging off houses and in a fire it simply melts away. Vinyl does look nice and requires less maintenance but over time the suns rays will fade and degrade the material. I have aluminum siding on my house that is 50 years old with no signs of it ever needing replacement, although the paint is starting to chalk. My redwood fence was 40 or more years old before I replaced it. I would stain it every few years but the posts rotted. I have seen people fall on their butts when vinyl chairs blow apart. We have been deceived by the industry. It is easier for them to manufacture and install and is more profitable. I settled for a composite fence that I am very pleased with but I noticed that Home Depot no longer sells it. It looks like redwood and it was more expensive. Three sections with posts and hardware cost me $1000 to install myself. A basketball will not damage it or people leaning on it and it requires no maintenance.